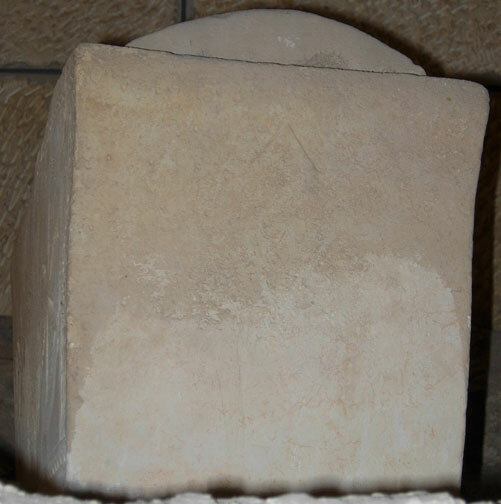 BlogHome » Blog » “Clarifying” the Dominus Flevit Tomb: What’s wrong with this picture? On Tuesday, May 1, members of our staff visited Dominus Flevit at the invitation of a film production team from the United States who were filming there. With our staff’s effort to understand the tomb and its ossuaries, and the film crew’s effort to retrace the sequence of events portrayed in the Lost Tomb, a number of “clarifications” may now be offered. Another sequence which interested us is the one that leads to Jacobovici’s discovery of the ossuary with the “chevron … identical to the one over the tomb.” On our visit this week, the same ossuary was indeed up and to the left as one enters the enclosed tomb area. [This is ossuary 66 in Bagatti’s publication Gli Scavi del “Dominus Flevit”.] In the film, Jacobovici finds an ossuary without a lid, containing a femur bone and the nozzle of an ancient juglet. The “chevron” is on one of the narrow sides of the ossuary facing outward. This is the state in which we also found the ossuary on Tuesday, with one important exception. The original stone lid was actually in place on the ossuary. This lid does not appear anywhere in the film. In the film, the ossuary was “discovered,” as though the lid were missing or non-existent. 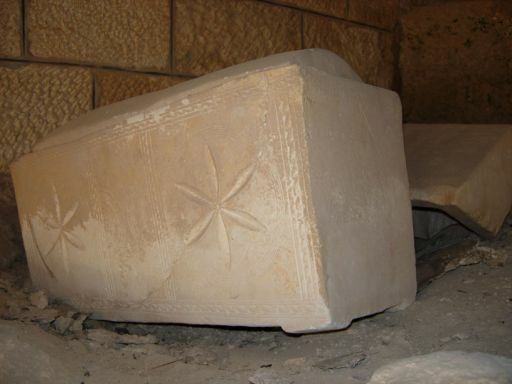 This tomb complex is presented in the film as being connected with the first century Judaeo-Christians, but more specifically, with the group perceived to be first century “Ebionites.” This lone ossuary has a symbol which has been identified as being the essential symbol of the Ebionites, as opposed to the cross. 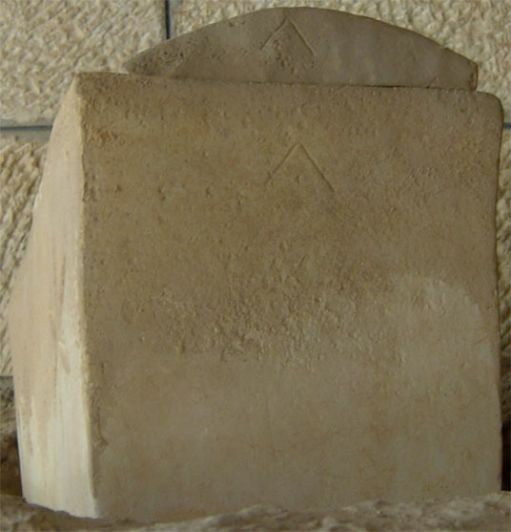 This symbol, an upside down “V” with a dot in the middle, hypothetically connects the Ebionites to the Talpiot tomb, where the same symbol apparently sits above its doorway. The filmmakers perceived this to be a symbol for Jesus, a stylized “taw” (the last letter of the Hebrew alphabet), since He proclaimed himself to be “the beginning and the end” in the book of Revelation. In the enactment in the film, the “true disciples of Jesus”, the Ebionites, have this symbol made on their foreheads to seal them as members. This symbol is attributed in the film (and, even more so, in the film’s website) to a number of secret societies from the Ebionites to the Templars to the Freemasons, whose secret rites and symbols come down to us today (even though, according to the filmmakers, the true meaning of the symbol has been widely misunderstood through the centuries). What’s does this picture tell us? What is really going on here?